Is weight loss a problem you can’t seem to solve? To lose weight, you must create a plan that’s Easy-to-Follow, Effective, and Enjoyable. If the program does not accomplish these 3Es, you won’t be able to stick with it long enough to reach your goal. The problem is that you’re busy. Taking the time to research the right foods and organize them into enjoyable, fat-burning meals can take hours each week. And, that doesn’t even take into consideration what to do if you have a question? Where do you find a trusted answer in the craziness of the Internet. My coaching program takes care of all of those overwhelming tasks for you. Most weight loss program tell you what to eat, but alone, that’s doesn’t solve your problem. Knowing what to eat seems like it should be the solution to losing weight, but if that were true, the majority of people would be thin. And for that matter, you probably know someone who eats all of the “wrong” foods and stays as skinny as a rail. Food is certainly part of your weight loss journey, and I understand that from both a professional and personal viewpoint. My career was spent teaching college-level health and nutrition courses. I’ve been an on-air health consultant for an ABC television affiliate. But, if your only focus is food, you’ll be a slave to the scale for the rest of your life. The primary goal of weight loss coaching is to help you figure out how to eat and move in ways that you enjoy, so you can reach your goal and stay there comfortably. Who is This Weight Loss Coaching Program For? If you are ready to leave your weight problem behind and break through your barriers, for yourself and your family, but you’re unsure how to do it, then this program is what you need. We all benefit from a coach, especially when it comes to breaking old habits and patterns. And this is really where my passion lies. I love teaching weight loss because I love helping people figure out how to reach their goals. When you lose weight and figure out how to keep it off without having to be constantly focused, you join an elite group of individuals. It’s fun, and I want you to experience it. I know you can do it, and it doesn’t matter if you’ve been overweight your whole life, or you’ve lost and gained the weight back many times. This is the only eating plan that has helped me lose weight, and I have tried many fad diets, convinced they would help. It is also a plan I can stick to for the rest of my life. A million thanks, Dr. Becky!! There are two types of problems when it comes to weight control; there’s the physical problem, and there’s a mindset problem. If both problems are not taken care of, you lose weight and gain it back again. Is your mindset in need of a tune-up? Have you ever had one of these self-sabotaging thoughts? ____ I have been overweight my whole life, I’ll never change. ____ I’ve already blown my diet today. I might as well give up and try again tomorrow. ____ It’s rude to not eat with my friends at a party. ____ People won’t like me if I’m thin. ____ I’m older. People naturally put on weight with age. ____ If I overeat today, I can make up for it by eating less tomorrow. ____ Other’s needs come before mine. Once they’re taken care of I can take care of me. ____ Dieting is not worth the effort. I’m just going to gain the weight back. ____ I can lose weight later. ____ I exercised. Now I can eat what I want. Can you see why all of your past diet attempts have failed? The simple fact is this: If you’re dieting, but ignoring these sabotaging thoughts, then the weight you lose will return…It’s only a matter of time. People that effortlessly control their weight and feel relaxed around food have corrected both their physical and mindset problems and interrupted their yo-yo cycle. Fortunately, my weight loss coaching program can help without having to psychoanalyze you. My story is a lot like yours. Through my teens and twenties, I was absolutely addicted to food, especially sugar. And, I was 50 pounds overweight because of it. I had two switches. I was either off sugar or on sugar – big time! I moved from that crazed, obsessive sugar addict to the calm, confident eater I am today by interrupting my habitual loop. Today, I’m not controlled by food. I can go to a party or go out with friends and not be focused on food. Today, it’s easy to relax in my living room on a quiet evening without a need to snack. Understand exactly how to eat to burn fat. Interrupt your destructive patterns to clear the path to weight loss. Understand what drives your cravings and hunger, so that you can outsmart them. Recognize the subtle cues that drag you back to your same dieting mistakes. Establish doable habits and then scale them up until weight control becomes something you do naturally. If permanent weight loss is your goal, you will need a roadmap that walks you through how to create the physical and mental habits that make your progress unstoppable. With my weight loss coaching program, you’ll learn what to eat and when to eat for maximum results, and you’ll also erase the destructive thoughts that used to pull you back to your old habits. You’ll finally understand how people keep weight off without micromanaging their diets. “I lost 50 pounds and kept it off for a year now. This has become part of my lifestyle now, and I really don’t have to think about it”. A weight loss program works when it’s easy-to-follow, enjoyable, and effective. To succeed at weight loss today, you not only need the right strategies, you also need a way to make those strategies work without completely disrupting your daily routine. Reaching your goal requires patience and a willingness to learn, but losing weight should not take over your life. If it does, you’ll quit. From my experiences teaching students, groups, and individuals, I’ve learned how to streamline the path to success. 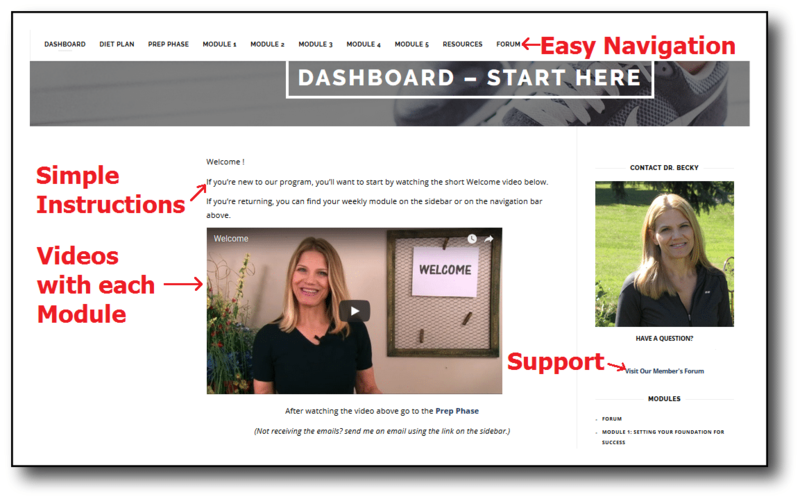 My weight loss coaching program is a video-guided course that is completed in 40-day cycles. All of the materials are organized for you on a private website that walks you step-by-step through the process. The program is broken into five modules that feed you the information in a logical order, so you have time to learn calmly and fully without pressure. Interested in a Ketogenic Diet? 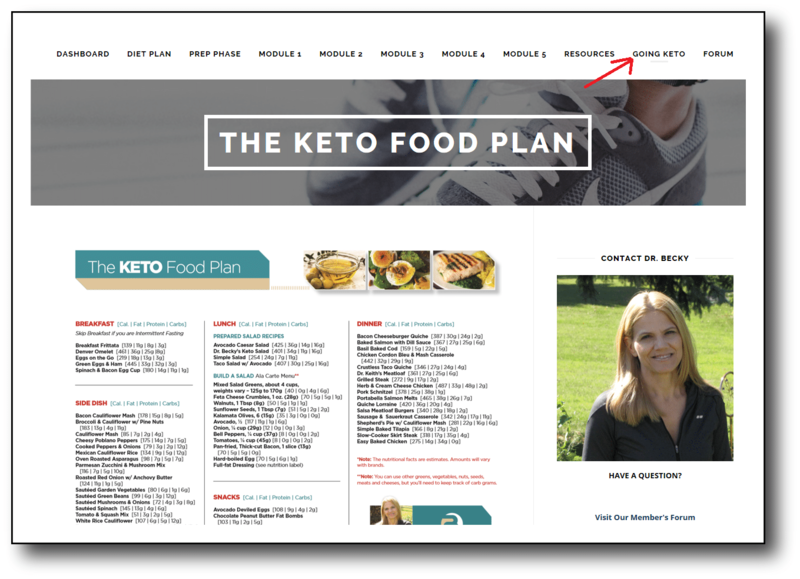 The coaching program comes with a special “Going Keto” section that explains how to convert our standard 0,1,2,3 Diet into a Ketogenic diet, which is a very-low-carb, high-fat diet that accelerates fat loss. You’ll receive a series of Keto Instructional Videos as well as a full Keto Food Plan that makes meal planning easy. **NEW! The Coaching Program now provides you with three week-long keto meal plans that eliminate the guesswork! These meal plans have been precisely calculated with the right mix of fat/protein/carbs to get your body into ketosis. When you come inside, you have full access to videos and written materials explaining how to follow the diet plan and how to create a rock-solid mindset using my exclusive 5-step formula. Well, that’s exactly what you get with the weight loss coaching program. Every step is crystal clear, so you stay on track and reinforce your learning each week. You’ll keep it sane and simple in your first week. That’s because the easier a program is to follow, the more likely you are to grasp it and use it. You’ll watch short videos that walk you through your diet rules. I explain exactly how to get the right mix of healthy fats, fiber, protein, and carbs for the best fat loss results and hunger control. You’ll also get introduced to the first of five fun and enlightening mindset-improvement exercises. The first one will Build Your Desire, so you pursue your goal with passion and enthusiasm. I find the coaching program very helpful. The videos are fantastic. I thought I knew what to do to lose weight but just couldn’t do it. 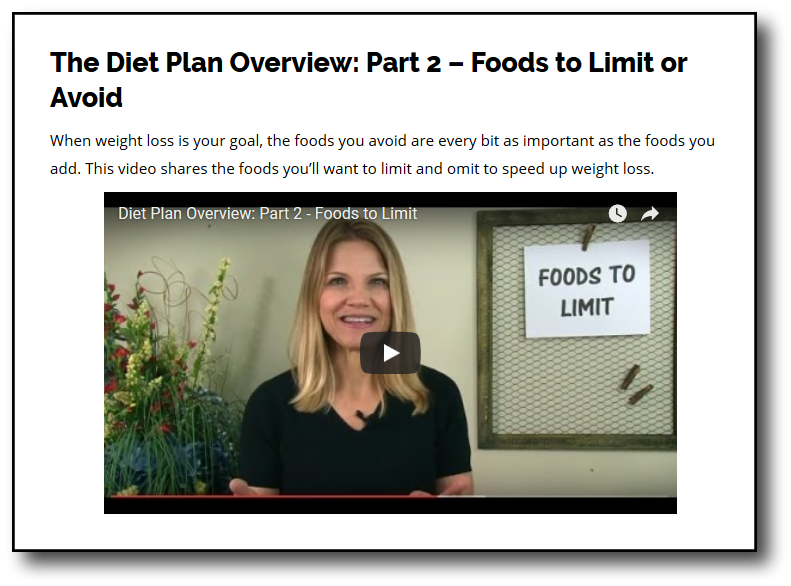 Your videos explain why it is important to include healthy fats and fiber in our meal plans. I have lost five pounds in the first week. Thank you Dr. Becky. This is my favorite week! As always, the video instruction is waiting to guide you through the week, but there’s so much more. Do you remember that list of self-sabotaging thoughts you read at the top of this page? Well, this week you’ll learn how to wipe those destructive beliefs off of your brain’s hard drive and install a new clean operating system. You’ll become a person who fully expects success. Automatic Negative Thoughts, or ANTS (as Dr. Daniel Amen calls them in his book Change Your Brain, Change Your Life), live inside each one of us and have the ability to eat holes through your goal. In Module 2, you’ll learn a fool-proof way to exterminate your ANTS. You’ll also learn one of my all-time favorite behavior modifiers. If overeating is a problem for you, you’ll use this to break away immediately and easily from your desire to eat. Week 3 of the program you’ll get detailed videos that further your understanding of what to eat and how much to eat to maximize your weight loss results. This week you’ll learn the secret to being unstoppable when you complete the Build Your Commitment exercise. Commitment is a funny thing. It can be very strong at the beginning of your goal and then wane as the weeks go on. With this week’s exercise, you weed out any hesitation about reaching your goal as you learn the simple strategy to keep your commitment strong. Also, in the week three module, it’s time to clean up your environment. You’ll start by taking a fun quiz to find out if the food cues that surround you are helping or hurting your efforts to lose weight. When you’re done with the quiz, you’ll take one day to set up your home for weight loss success by completing the 10 Steps to a Cleaner Kitchen Environment checklist. By this week you’ll feel in control of your eating, but just to be certain, I’m right there with you on video recapping the rules. To lose weight and keep it off, you must feel deserving and worthy of living life at your ideal weight. This seems like a fairly basic statement, yet you may have past experiences that left you with a negative self-image and a critical inner voice. In this module, you’ll learn how to identify and turn around your critical inner voice using the Build Your Self-Worth exercise. This understanding sets you free to lose all the weight you want. 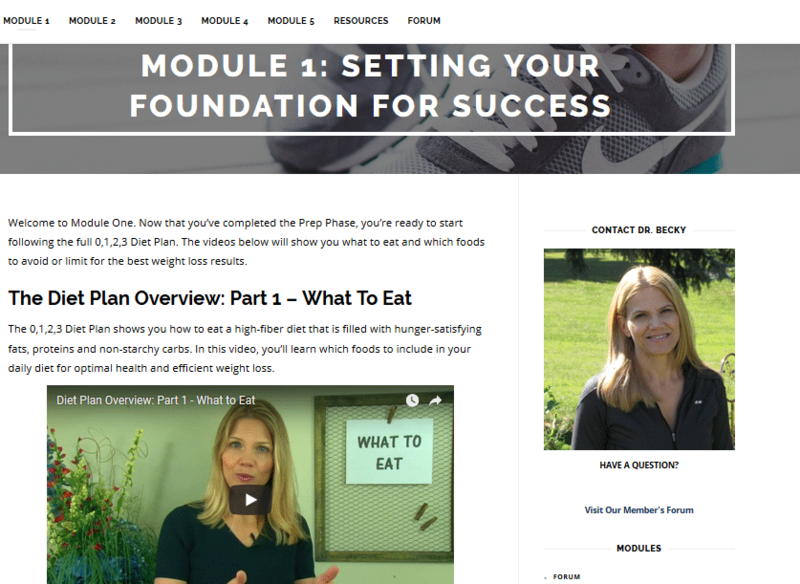 Module 5 carries you through to Day 40 and the end of your first dieting session. Day 41 you take a day off, which is highly motivational. My video explains how it works. In this module, you’ll complete your last mental habit exercise as you learn how to Build Your Flexibility. Life will not slow down so you can concentrate on reaching your goal. In fact, sometimes it feels like life is conspiring against you! This section shows you how to stay on course, even when things don’t go as planned. One-Time Fee. You’ll pay once and enjoy the benefits of the coaching program for years to come. There are no recurring costs when you join the 0,1,2,3 Weight Loss Coaching Program. You’ll be able to go back through the materials as often as you want. Video Diet Instructions. Don’t like to read? I’ll tell you exactly what to eat. There are more than 30 exclusive videos that walk you through each step. Ready-to-Follow Meal Plans. When you want to change your weight, you need that information organized into a usable form. You need to know what to eat, which is why the meal plans are such an enormous value. And, the meal plans vary in their level of macronutrients (i.e. fat, protein, carbs) to accelerate results in even the most weight-resistant bodies! Going Keto Section. New! If you want to follow a ketogenic diet, you’ll be able to do so with ease thanks to the Keto Instructional Videos as well as a full Keto Food Plan and three week-long Keto Meal Plans that makes planning your meals a snap. Member’s Forum. Support is an important part of your success, and with the coaching forum, you’ll have the support you need to succeed. With the forum, you can ask questions, share ideas, and meet others on your same journey. 5-Step Weight Loss Mindset Training. This is a one-of-a-kind training series that I have been developing since 2008. It’s what will turn you from an anxious junk food junkie into a peaceful and self-assured healthy eater. A.N.T.S. Extermination Plan. Those sneaky Automatic Negative Thoughts that sabotaged your diets in the past don’t stand a chance as you learn how to stomp them out. End Emotional Eating Guide. Would you like to improve your relationship with food? Here’s how it’s done. Mindless Eating Behavior Modifiers. These easy to implement behavior modifications put you in control of any eating situation. Exercise Tips & Strategies. Go from good to great by adding exercise. Learn the quick trick to finding the best exercise for you. Maintenance Plan. The 0,1,2,3+ Diet Plan™, which is what you’ll follow to get the pounds off, works because it’s easy-to-follow, effective and enjoyable. That’s the same way you’ll keep those pounds away. As an instructor of nutrition, I know that it is not enough to lose weight, you must also eat for health and enjoyment. I’ve formulated the recipes and meal plans to provide you with the right mix of nutrients. The diet will keep your carbs low and put an emphasis on healthy fats and fiber. You’ll be shown how to pick foods that provide these important nutrients and taught why they are the secret to fat loss and hunger control. You’ll be shown how to calculate the right amount of protein grams to keep you in good health and how to determine how many calories your body needs to lose weight on a consistent basis. The Weight Loss Coaching Program has you follow my 0,1,2,3 Diet Plan and the videos help to drive home exactly what to eat to maximize fat loss and hunger control. When you join the coaching program you get both a low-carb diet plan and a ketogenic diet plan. I (Dr. Becky) follow a low-carb diet, but my husband, Dr. Keith, follows a ketogenic diet. Many of you are familiar with my husband through our YouTube videos that document his success with a ketogenic diet, and you’re wondering which diet is right for you. In the “Going Keto” section of our membership site, you’ll be taught the differences between a low-carb diet and a keto diet, so you can make an informed choice. With both diets fully developed for you, you can’t go wrong! What If I’m on a Vegan, Vegetarian, or Gluten-Free Diet? The recipe book that is provided with the coaching program is an expanded edition with 81 vegan-friendly recipes and 33 additional vegetarian-friendly recipes. However, the meal plans are not vegetarian. While a vegetarian can follow the program, they will need to design their own meal plans. If you prefer to avoid gluten, the plan will suit your needs. There are only a few recipes that contain oats and grains, so the majority of the recipes are naturally gluten-free. Will I Communicate with Dr. Becky Directly? As a member of the coaching program, you will follow a series of videos featuring Dr. Becky. She will guide you from start to finish explaining everything from the supplies to gather, to the foods to eat (and avoid), to how to maintain your weight loss. Dr. Becky is active in the members-only forum. While this coaching program does not give you access to Dr. Becky via phone, she will reply directly to your questions via the forum. I want you to succeed. I want you to eliminate this weight issue from your life, and I want to share with you exactly how to do it without the fluff and the hype. I know the shame and frustration of losing weight and gaining it back again. I yo-yo dieted for years before I figured out what was going on. You can figure this out as well; you just need a system to walk you through how to do it. The 0,1,2,3+ Weight Loss Coaching Program takes you every step of the way. It saves you so much time and aggravation. I know my program works because it has worked for me and it has worked for my clients. And here’s the thing I want to emphasize to you…time doesn’t wait. If you choose to walk away and NOT join the weight loss coaching program, then 40 days from now, you’ll wish you had started today. Pass on this opportunity and instead of getting the formula for fat loss and exterminating those automatic negative thoughts that pull you back to your old habits, you’ll still be fighting to keep every pound off. The point is this: you can start today knowing nothing and in 40 days have a brand new success mindset that keeps your weight off without any conscious effort whatsoever. Is Easy, Enjoyable, and Effective Weight Control Something You’ve Been Wanting? 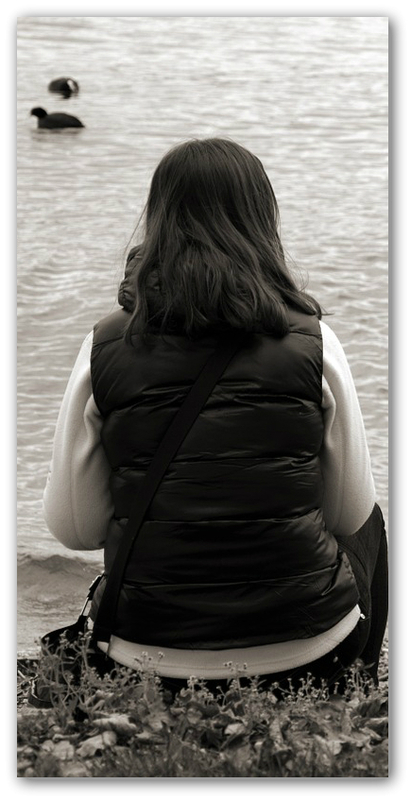 Do you want to be able to go out to dinner with friends and be focused on them, not the food? Do you want to feel relaxed in the evenings, instead of locked in a nightly battle with burdensome thoughts of binging on junk food? If so, then take advantage of this rare chance to wipe out both your physical and mindset challenges. Time doesn’t wait, start today and in 40 days you’ll feel unstoppable. I stand behind that statement with a full guarantee. Here it is: the cost of access to The 0,1,2,3+ Weight Loss Coaching Program is only $97.00. If you decide you want your money back from me anytime during the next 60 days after your purchase, just request a refund. It’s that simple. No questions asked. No hassles. No delays. I’ll send it back to you just as quickly as you sent it to me. That seems only fair. I want to end this letter with a few more comments from people, just like you, who have worked with me in the past. They say it better than I ever could. P.S. If you’ve struggled with yo-yo dieting in the past, you’ve had trouble staying motivated, or you are an emotional eater, then this program is ideal for you. P.P.S You can contact my team at any time if you have questions, by emailing contact@drbeckyfitness.com. The 0,1,2,3+ Weight Loss Coaching Program works, and I stake my reputation on it! If you have any questions, even before you purchase the plan, feel free to send an email and we will give you the attention you need. NOTE: Your order will be handled through ClickBank’s secure server. Your program is easily and conveniently accessed on our password-controlled website. No physical products will be shipped. After you order, you will get INSTANT ACCESS to the registration page. You will be able to view all materials with ease on any device.